The new Steon bollards are here! 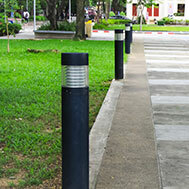 Steon Lighting are pleased to announce the introduction of our new LED bollards. Our robust range of bollards are functional, efficient and reliable therefore the perfect solution for exterior lighting schemes, they provide style throughout the day and safety throughout the nights. These luminaires are not only aesthetically pleasing but are also exceptionally functional with a life expectancy in excess of 50,000 hours. The comprehensive range includes luminaires suited to a variety of different applications, from parks, pathways and roadsides to areas which experience harsh weather conditions such as coastlines. See our new range of LED bollards here.